Michigan in March with temperatures close to eighty – say what?! I haven’t had a chance to wear my cute furry boots – and now I’m thinking, where are my shorts. The grass is green, and flowers are blooming – should I be planting lettuce? I’m sure not complaining, but something’s not jiving. The forecast says summer but my mindset’s in winter, as are the produce bins in local groceries; alas, local vegetables haven’t caught up with the weather. And there are wintry recipes unsung; hot soups to be made, slow braises to be simmered. But before I fling open my windows and fire up the grill, I present to you a swan song for root vegetables – winter’s steadfast nourishment – an ode to the turnip. Turnip bruisers weighing in around 1 pound each: perfect size for a full meal. Trim bottom so it doesn't fall over and top so you can carve a cavity. With a melon baller, scoop out turnip to make a turnip shell. Finely chop turnip and mushrooms & sauté. Stir in garlic and spinach in the last few minutes of cooking time. 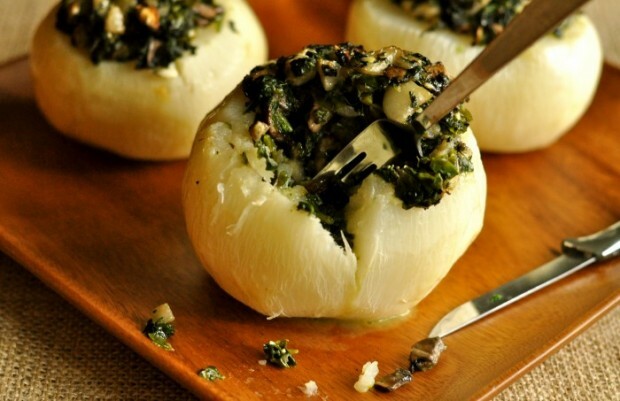 Rub a thin pat of butter over partially cooked stuffed turnip then return to oven. Outside of the American South, turnips are often snubbed and forgotten, much like a distant cousin you regret is blood kin. In literature, similes are drawn casting a disparaging shadow on characters with, for example, “…a bulbous nose, with purplish broken vessels resembling a turnip.” And if you do cook them, reluctant, with greens or in a soup, the smells may be reminiscent of bad hangovers and hardscrabble times. But not so in France, where their peppery flavor and piquant aroma are relished in a variety of ways. I, too, adore the bittersweet flavor of turnips. So indulge me as I pause between winter and spring, to stuff the turnip with blue cheese and walnuts, giving her the star status she so desperately seeks, so richly deserves. A favorite recipe site of mine, Citron et Vanille, is authored by Silvia, an inventive chef from France, who writes that she serves them roasted, braised and steamed with lavender salt, or stuffed in a myriad of ways. I saw this recipe on her site and couldn’t resist trying it. In her recipe she chose smaller turnips, which are sweeter and less bitter than her big sisters that I selected. But I’ve always been one who appreciates the taciturn dinner guest who injects irony, balancing humor, into conversation. Still haven’t convinced you to give turnips another try? Having developed a thick skin through centuries of being an outcast, she’s OK with that. Substitute the turnip for an onion or beet and you’ll still have a fine meal. This recipe was inspired by a recipe for Turnips stuffed with Roquefort and Walnuts on the web site, Citron et Vanille. In my rendition I substituted Gorgonzola for Roquefort, omitted the chopped onions and used 3 large turnips instead of 6 medium-sized. Trim bottom of turnips so they sit flat without rolling, and cut about 1-2 inches of root end off. Peel turnips. To make a cavity in turnip, with a melon baller, dig out turnip to a depth of 2 inches. Chop turnip finely and set aside. Bring a large pot of well-salted water to a rolling boil. Place turnips in pot and boil 10 minutes, or until just tender. Drain and reserve. Meanwhile, heat olive oil in a large sauté pan over medium heat, sauté reserved chopped turnips and mushrooms with a pinch of kosher salt until tender, about 10 minutes, then stir in spinach and garlic; cook an additional 5 minutes. Remove from heat and stir in cheese and walnuts. Season to taste with kosher salt and freshly ground pepper. Stuff the turnips with mixture. Bake on center rack of oven 15 minutes. Remove and rub butter pat around turnip and on top of spinach mixture; return to oven for an additional 10 minutes. *I microwaved 3 cups of chopped, frozen spinach with a bit of water until tender. Then, I pressed the spinach into a fine-mesh colander removing as much liquid as possible, which yielded about 1 cup, chopped fine. More Recipes Filed Under "Vegetables & legumes"
I love walnuts, but my husband hates them! Can you recommend an alternative to appease my picky partner? This recipe looks absolutely delish! Hmm…walnuts – and I thought the push back would be the turnips! If he doesn’t like walnuts, I’m making the leap to assume he doesn’t like pecans (which would be a wonderful sub.) Pinenuts perhaps? The stuffing could stand alone without nuts; so that may be the way to go! Let me know how the recipe works for you…so good! I would never have thought of stuffing turnips!! I want to add new and healthy choices but would never have thought of this. Thank you again for some great ideas!